I was so lucky this past Christmas, to be given one of my favorite gifts – a $50 Whole Foods Gift Card. I vowed to only purchase products I have been meaning to try and just haven’t been able to “justify” for my tight weekly budget. So, soon after the New Year passed, I decided to do a first round of product sweeping. Whoever said eating gluten-free will make you lose weight has never walked through the gluten-free sections of their local grocery or natural food stores. Just sayin’. And with that being said…we also know that the women in my family have quite the sweet tooth. Oh yes…we all do come by it honestly. And while for some people it’s cakes and cupcakes that they want…for me, it’s always been the simple, yet ultimately delicious…COOKIE. Call me cookie monster, because I love cookies. All types of cookies. I have my favorites, sure, but…cookies are my kryptonite. Well, there I was, perusing the aisles I had been skipping whenever in Whole Foods, when the giant cookies near the bottom shelf sort of just…sang to me. It was a brand I was unfamiliar with – CraveRight. So, I leaned down and picked one up…noting that these were not just gluten free, but also dairy free, soy free, egg free, nut free, and corn free. They used no flours or starches, and actually was billing itself as a “natural meal replacement.” Really? A cookie? There were three flavors of the jumbo cookies – Sesame Crunch, Chocolate Chunk, and Brownie Chocolate Chunk. Next to them were cookie packs of the same cookies, smaller scale, more inside. My roommate said, “get one of the big ones…just in case we don’t like them.” Okay…good point. I was all set for that Brownie Chocolate Chunk and I somehow let her talk me into the Sesame Crunch. “You don’t often see sesame cookies!” That was her thoughts on that matter. And…I went along with it. And this CraveRight Gluten Free Jumbo Sesame Crunch Cookie…made it home with me. CraveRight was created in 2009, creating “crave-worthy cookies that don’t sabotage wellness goals but reinforce them.” Tired of seeing so-called “healthy snacks” that weren’t really that good for you being sold on the market – many of which could not be eaten by people with food allergies and intolerances, and the taste all wrong – Roya S. came up with the idea of creating delicious, healthy treats – specifically their specialty – their 100% vegan, gluten-free, and nut-free cookies. All of the cookies are baked and prepared in a dedicated gluten-free and nut-free facility so cross-contamination is not a problem. CraveRight cookies are baked up being packaed with antioxidants and essential amino acids. Not only that, they are proud that their cookies contain no empty-calorie ingredients – no flours, starches or fillers. The CraveRight cookies are rich in iron and calcium, and low in sodium as well. And, the company sources their ingredients from nearby, making sure that the ingredients are minimally processed (without chemicals) and made with only the finest of ingredients, free of contaminants. Which, all sounds really good on paper, right? But how do they taste? I can only vouch for the CraveRight Gluten Free Jumbo Sesame Crunch Cookie…which I split with my roommate last night for dessert. You know, I was having a bad day…I just ate an amazing comfort food dinner and was all set for dessert. I grabbed the CraveRight Gluten Free Jumbo Sesame Crunch Cookie off my counter and declared it to be dessert. If anything could make me feel better, it would be a cookie, right? So, as is typical with huge cookies…I cut it in half and gave one side to my roommate while claiming the other for myself. I climbed back onto the couch, restarted the episode of Game of Thrones I was watching, and took my first bite. And I think my nose wrinkled up a little bit. But it was only one bite. Maybe my palate just needed cleansing. So, I gave it another taste. Nope. This was not a cookie I was enjoying. 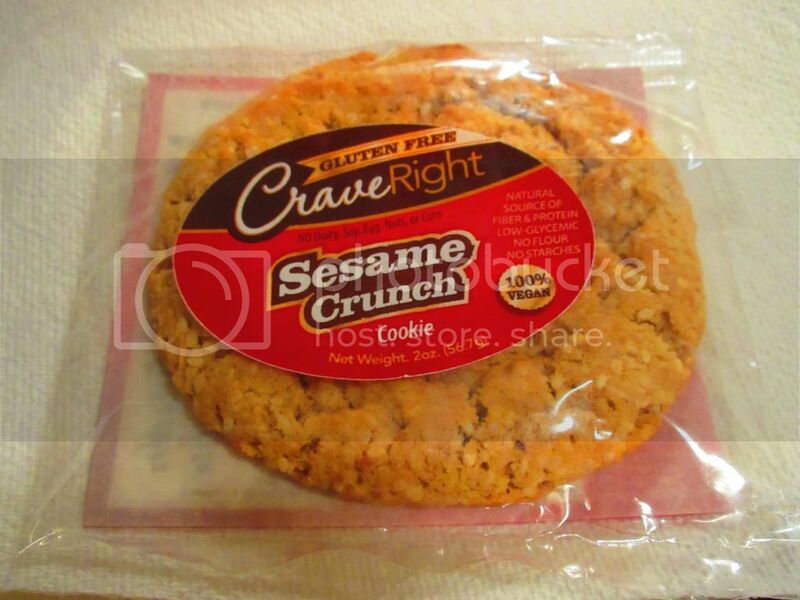 The CraveRight Gluten Free Jumbo Sesame Crunch Cookie was everything I didn’t like about a cookie. The texture was crumbly. I’m fine with a bit of crunch on my cookie, but I don’t want it to crumble when I try to eat it. I have no kitchen or dining room table in my apartment, and I don’t want to have to vacuum my couch after dessert, thank you very much. The flavor lacked sweetness. I mean, regardless of whether a cookie is billed as a “healthy meal replacement” or not, I want it to taste like a cookie. And this didn’t. It tasted like…a snack. Like those savory sesame sticks that were put into snack mixes and most people skipped eating. I think I was expecting something like a sunbutter cookie…a little more richness and depth of flavor, but that’s not what I got at all. They were bland and rather…tasteless. That bit of sesame came through in the end, but that’s about all I can say about that. It was not a winning cookie in my book, and we know I eat lots of cookies. The part near the middle was slightly chewy, but everything else was just…wrong. I wasn’t a fan at all. As far as what goes into the CraveRight Gluten Free Jumbo Sesame Crunch Cookies…it seems rather basic. So…that is good. These cookies are made from sesame seeds, palm shortening, demerara sugar, tahini, sesame powder, water, chicory extract, flax meal, baking soda, baking powder, and sea salt. Not actually a bad list of ingredients. It’s just too bad they didn’t come together to form a cohesively delicious cookie. Since the CraveRight Gluten Free Sesame Crunch Cookie is billed as a “natural meal replacement” and carries the sentiment “Crave One. Eat Two.” on each package, let’s really focus for a moment on these nutritional facts. 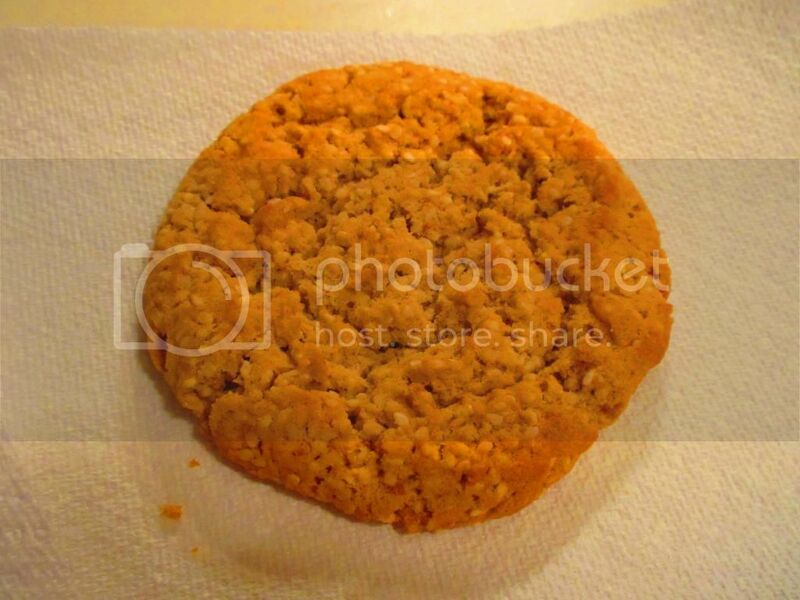 A serving size of the CraveRight Gluten Free Jumbo Sesame Crunch Cookie is 1/2 of the cookie. Yes…half. This half will deliver 170 calories and 13 grams of fat. These cookies are cholesterol free, have only 90 mg sodium per serving and only 5 grams of sugar. One serving will also give you 3 grams of fiber and 6 grams of protein. I still don’t think I’d eat a cookie instead of my dinner though. Just sayin’. So, color me unimpressed and highly disappointed. I was not at all craving another bite of the CraveRight Gluten Free Sesame Crunch Cookie. In fact, it was a struggle just to get the half I had finished. It wasn’t what I wanted in a cookie at all, “healthy” or not. Beyond disappointed. I felt cheated out of my dessert last night. This entry was posted in Baked Goods, Clean Eating, Cookies, Dessert, Food, Gluten-Free, Paleo, Products, Review, Snacks, Sweet Stuff, Vegan, Vegetarian by The Celiathlete. Bookmark the permalink.